Update (16th August): Lisa tells me Christie has been adopted. Yay! I mentioned last week that I live with a not-so-cat person, but the truth is I’m not really a cat person either. Which I further understood when Lisa sent me info about a couple of cats this week and I was immediately drawn to the one who will thrive in a home without dogs or small, energetic children. (I live in a home with a dog and a very energetic small child.) Of course, I’m doing this series of posts about homeless cats because I think maybe one of you cat people might have the perfect home for her. So. 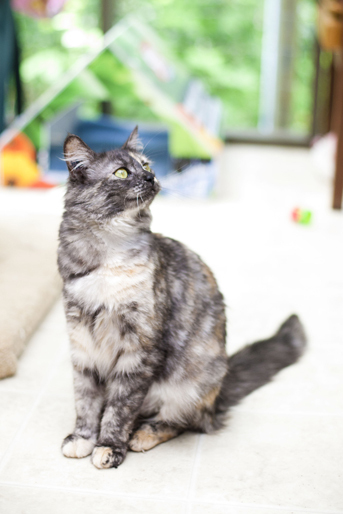 Meet Christie, a young and perky cat who was a stray and now lives at Katie’s Place. She seems to get along well with the other cats in her room and has an amazing disposition. She is nervous about being picked up and can give a nibble or a nervous whine if she feels overwhelmed, but she longs for the love and comes right back for more. For this reason, she may not do well in a home with dogs or very small or energetic children. Christie will most certainly learn to trust more as volunteers interact with her more, but if you’re willing to be patient and loving, go see this beautiful and affectionate girl. These photos were taken by Cindy Hughes of Muddy Love Pet Photography as part of the Orphan Animal Pics project. She is so pretty! I wish that more people would adopt adult cats. My cat was an old barn cat who was abandoned for having too many kittens. 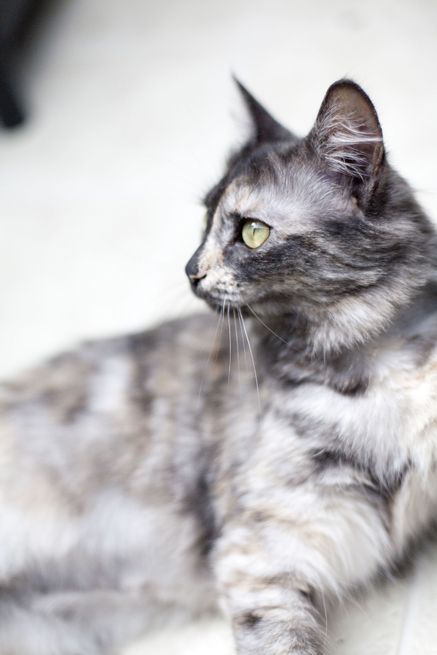 When the shelter took her in, she was nursing a litter of kittens and already heavily pregnant with a second litter. Of course all the kittens were adopted right away, but she spent a year and a half in the shelter before we came along. aw – the poor mums… it’s great that people are willing to adopt the kittens that pack the shelters in kitten season, but the poor mom cats always have wait so much longer for their forever family to come along!